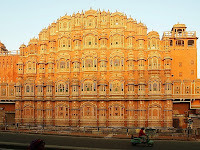 Hawa Mahal is a major landmark and a famous tourist attraction of Jaipur. The Palace offers a beautiful sight to behold. 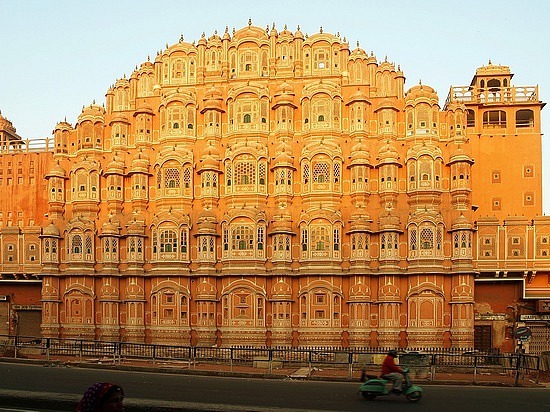 The splendid Rajputana architecture of Hawa Mahal, still speaks the glory of the royal family. However, one can also find a glimpse of Mughal architecture, which is blended perfectly to make it different from others. The literal meaning of Hawa Mahal is Palace of Winds.The palace was designed by Lal Chand Usta, who also planned Jaipur city or Pink city. Its unique five-story exterior is also comparable to the honeycomb of the beehive with its 953 small windows that are decorated with intricate lattice work. 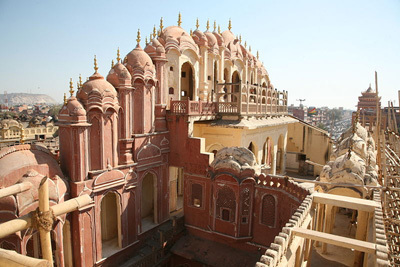 Hawa Mahal was built by Maharaja Sawai Pratap Singh in 1799. It is beautifully outlined with white borders and its motifs are painted with quick lime. The monument provides a spectacular view of Jaipur city overlooking the road avenues, intersections and colorful crowds in the market. It was originally conceived in the era when ladies lived behind veils and screens so that the ladies of the royal household can see glimpses of the everyday life and the royal processions in the city without being seen by others. The architectural design is based on certain scientific principle. Hot wind becomes cool when contracted. Hawa mahal has hundreds of small sized windows. Hot wind compressed while entering through the small sized windows and becomes cool. Hence, air enters into the palace is always cool irrespective of weather. 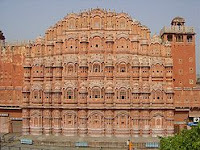 The Royal family of Jaipur used to come and live in Hawa mahal during summer season and hot summer days. There was a famous program of music broadcasted through radio named Hawa mahal. This shows the popularity of this palace. Early morning is considered as the best time to visit the Palace, when it is drenched in the golden light of the Sun. At this time, Hawa Mahal appears incredible. One cannot possibly describe the beauty of the Palace in words. The golden light of the early morning sun floats beautifully through the windows of this palace creating a wonderful sight for one and all. The palace has to be visited to experience the true beauty.